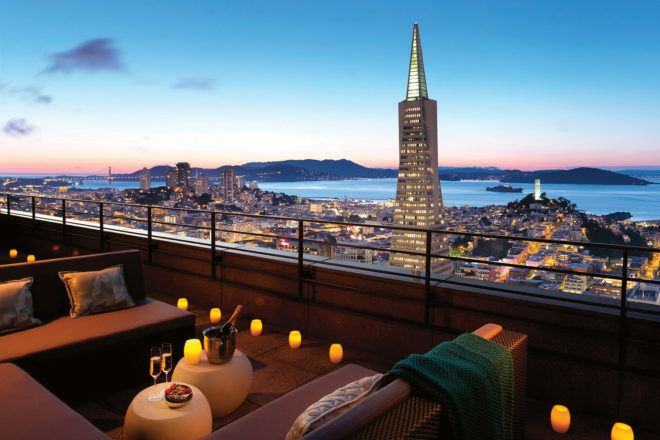 Views of the city don't get much better than atop the legendary Mandarin Oriental San Francisco. Views of the city don’t get much better than atop the legendary Mandarin Oriental San Francisco. It’s not every day you have the panoramic trifecta of a sparkling city, a sprawling bay and an iconic landmark to enjoy from your private 800 square-foot rooftop terrace. This is the Oriental Suite – the penthouse at San Francisco’s Mandarin Oriental. The one-bedroom suite is as divine inside as it is out; a plush king-size bed, a spacious and luxe marble bathroom with an oversized tub and separate shower, Molton Brown toiletries, and a living area that’s decked out in contemporary décor. When you’ve eaten everything on the room service menu – and must drag yourself away from the suite – there is plenty to keep you satisfied. The hotel, which promises a blended ambience of Californian charisma and Oriental charm, has a casual brasserie and bar, fitness centre, and a day spa. An Oriental meridian massage and rainforest shower after a busy day exploring? Sign us up. And being so centrally located means easy access to the best of San Fran: Fisherman’s Wharf, Union Square, Chinatown and the Ferry Building are only a short walk away. You could almost map out your itinerary looking down from your terrace.